With those evocative words Yeats began his essay on William Blake. Blake was, in Yeats’ estimation, one of these men who loved the future like a mistress. If he were thinking of nations rather than individuals, Yeats’ might have spoken those same words of American culture. To say that throughout their history Americans have been more interested in looking forward to the future rather than backwards at the past is a generalization, but it is rather safe one to make. During the planning that had led up to the Fair, architect and philosopher of technology Lewis Mumford had called for the Fair to be a concrete anticipation of “the future of the whole civilization.” This heady, vaguely spiritualized optimism and expectation for the world of tomorrow is all the more remarkable when we consider that it was articulated and experienced in the latter years of the Great Depression. This may not be all that surprising if we imagine that the hardship of the Depression made people all the more hungry for an escapist model of the future. However, we might also consider the possibility that the Depression could just as easily have quelled all optimism and hope for the future after the very long decade. And this is our segue to the present. It appears that the cultural mood has shifted. Our collective eyes seemed to be fixed not on the future, but on the past. One indicator of this shift is the resurgence of nostalgia in popular culture that we have noted here before. The nostalgic turn, however, did not just emerge with Mad Men (and now its imitations) and Instagram’s faux-vintage photo apps. It was noted by scholars in the 1990’s and is complicit with the postmodern repurposing of the past as far back as the 1970s. Take all of these together and over the last generation something has been afoot. And if it might be described as a gradual reorientation of American society’s collective gaze toward past rather than the future, then it amounts a startling transformation of immense cultural consequence. When tracked against the admittedly lofty hopes of the 1950s and 1960s, technological progress has fallen short in many domains. Consider the most literal instance of non-acceleration: We are no longer moving faster. The centuries-long acceleration of travel speeds — from ever-faster sailing ships in the 16th through 18th centuries, to the advent of ever-faster railroads in the 19th century, and ever-faster cars and airplanes in the 20th century — reversed with the decommissioning of the Concorde in 2003 … Today’s advocates of space jets, lunar vacations, and the manned exploration of the solar system appear to hail from another planet. A faded 1964 Popular Science cover story — “Who’ll Fly You at 2,000 m.p.h. ?” — barely recalls the dreams of a bygone age. In 30 years America will be a post-industrial society. . . . There will be only four work days a week of seven hours per day. The year will be comprised of 39 work weeks and 13 weeks of vacation. With weekends and holidays this makes 147 work days a year and 218 free days a year. All this within a single generation. It’s not unusual, of course, for predictions of this sort to dissolve in the more turbulent waters of reality, but it’s not just that the prediction turned out to be mistaken, it’s that the thought of making any kind of similar prediction today would appear absurd, silly, or infantile. I’m not necessarily endorsing Thiel’s argument, in fact, I’m not even sure Thiel is endorsing his argument, it felt more like a speculative piece than an argument. But it does add to the growing number of data points that together suggest Americans may be losing their confidence in the future. It would be ill advised to pin this on any one cause, but I especially want to resist pinning this on the economic downturn itself. 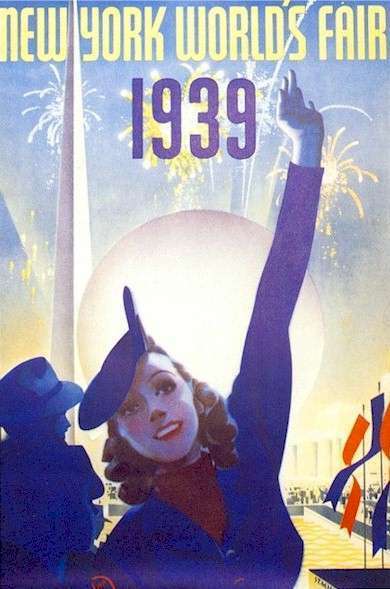 Remember the exuberance of the 1939 World’s Fair came after ten years of the Great Depression and while the light at the end of the tunnel was not quite visible. So any thoughts? What’s your take on the future? Any other relevant cultural indicators you can think of?